Before 2014 draws to a close, I wanted to take this opportunity to thank all of you for following me here, as well as on Facebook, Twitter and Pinterest. In 2015 I am planning to post more healthy breakfast and snack ideas. 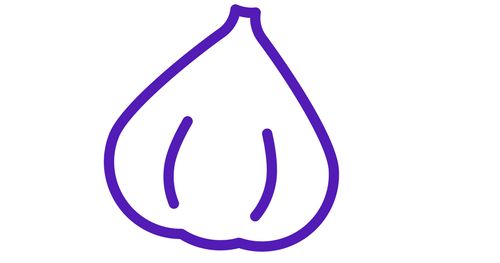 I am also developing some bread recipes, both GFCF and GAPS, which I hope be able to have ready for you soon. 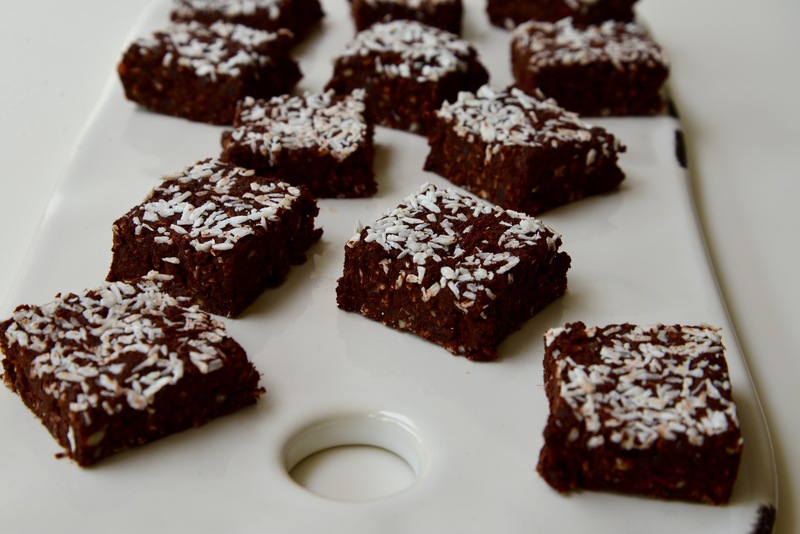 And I would like to cook more desserts that are free of gluten, dairy and refined sugar – so watch this space. 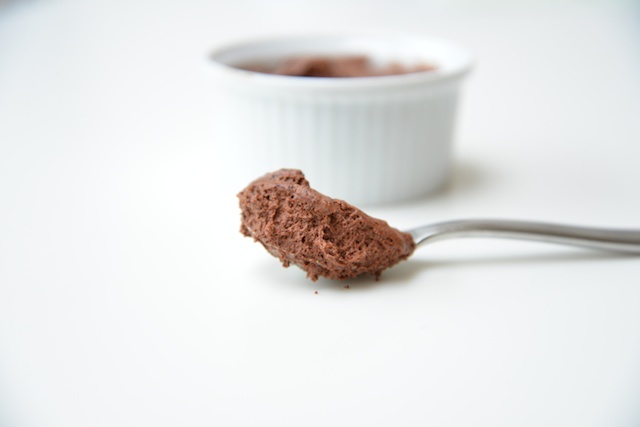 In the meantime, with no apologies, here is a chocoholic’s dream of a recipe for dairy-free chocolate mousse. Enjoy! 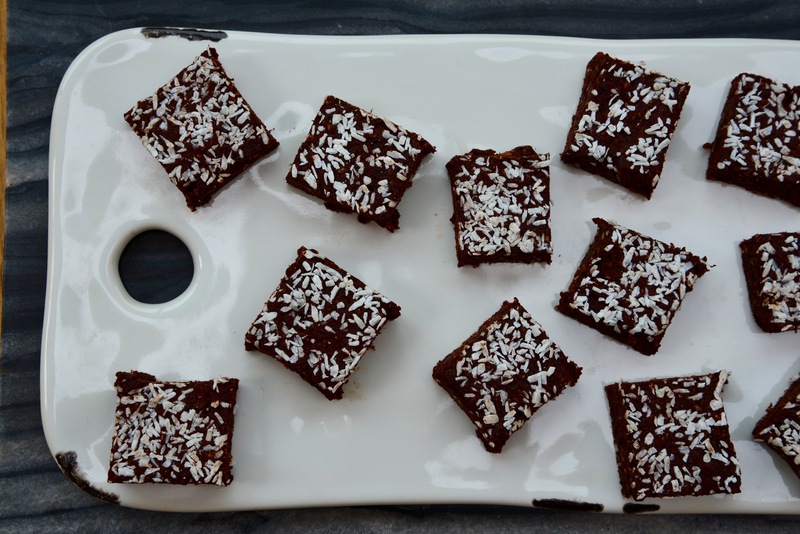 Break the chocolate into squares and melt in a bowl over a pan of hot water, on the hob. Mix the hot water and the cocoa powder to form a thick paste. 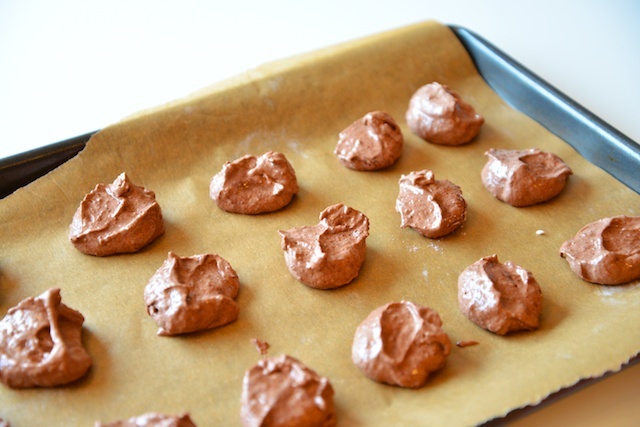 Combine with the melted chocolate and egg yolks and mix well. Set aside to cool. Whip the egg whites, gradually adding the sugar. Add a third of the egg whites into the chocolate batter, mixing well, then fold in the rest carefully. 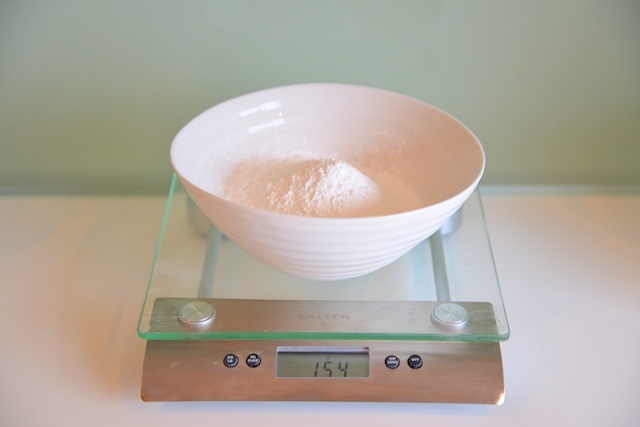 Put the mixture into a large bowl or eight small bowls, glasses or ramekins. April is a month of birthdays at my house. And thus a month of baking as well – so there will be plenty of gluten and dairy free celebration recipes to share with you over the coming weeks. We kicked off the festivities with a chocolate olive oil cake that is one of my family’s firm favorites. It is a very rich, moist cake that is a breeze to make (especially with a small helper) and appeals to adults and children alike. I made the cake with my daughter and we used a peppery Spanish olive oil that gave the cake a bit of a kick – but you can stick with a mild olive oil for a more classic taste. Measure the cocoa powder into a bowl, then slowly add the boiling water and whisk well until the mixture forms a thick chocolate paste. Add the vanilla extract then set aside to cool. In another bowl, combine the ground almonds, baking powder and salt. In a large bowl, beat the eggs and mix in the sugar and olive oil using a handheld or standing electric mixer until the mixture is pale and creamy, about two minutes, then gradually add the chocolate paste and mix well. Fold in the dry ingredients, then pour the batter into a 23cm springform cake pan, lined and greased (I use ghee but you could also use a bit of oil). Bake for 45-50 minutes, until the sides are firmly set but the top is still slightly springy to the touch. Cool on a rack, then remove from the tin. 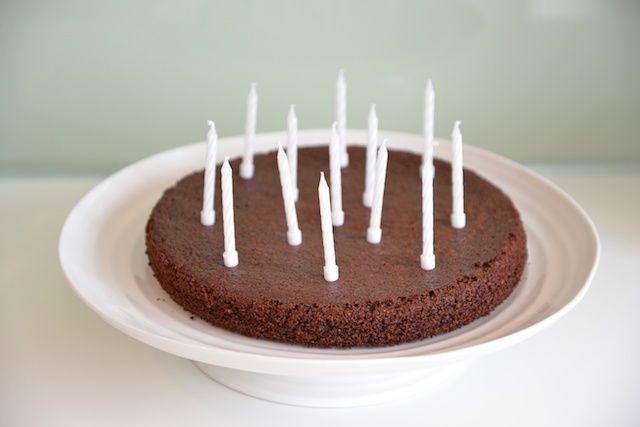 Insert suitable number of candles. My children and I do not see entirely eye to eye on what makes a fun cooking project. On a rainy “let’s make something” day, I might suggest we attempt pavlova, or California rolls, or something slightly ambitious that I bookmarked in my Charcuterie book. The kids, on the other hand, love to make rice krispie treats. It’s pointless to argue. The recipe is simple enough that very little adult supervision is required. Also, it is not only gluten and dairy free, but also nut free. 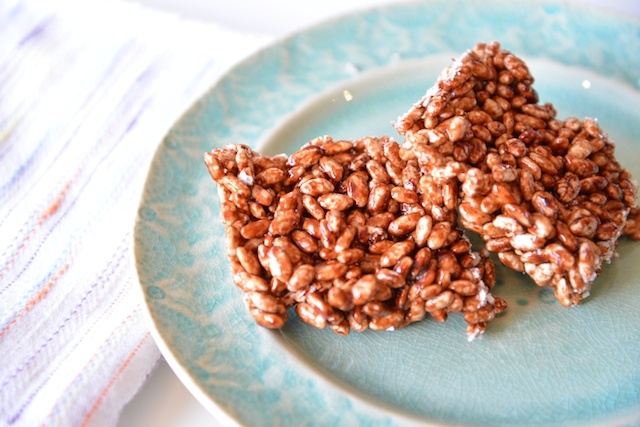 But the main point is really that kids love to make rice krispie treats because kids love to eat rice krispie treats. Makes enough to feed a houseful of kids. Heat the golden syrup over a low flame in a large heavy bottomed pan or dutch oven. Add the cocoa powder and whisk until smooth. Remove from the hob and stir in the rice cereal. Transfer to a lightly-oiled, high-rimmed baking tray, spreading evenly. Refrigerate for one hour or until firmly set. 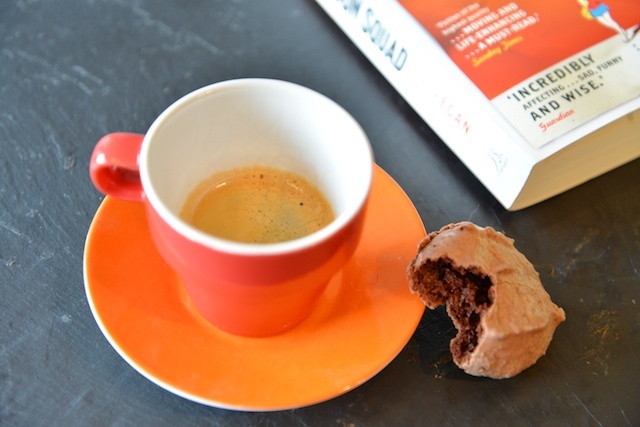 Last night I hosted my book club and I decided at the last minute to treat everyone to some chocolate macaroons. 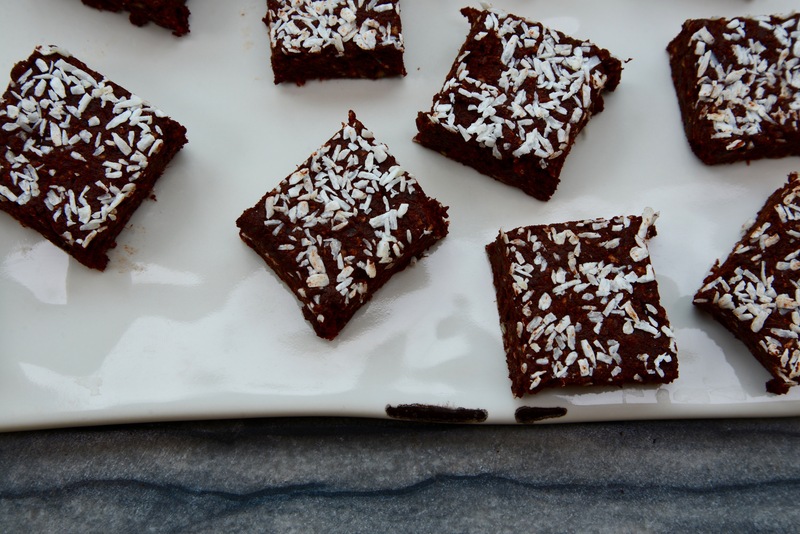 I nearly always have the ingredients for this recipe in my pantry. It’s also a very quick recipe, both in prep time and in baking time. Which last night was a good thing as I needed a few minutes to refresh my memory on some key plot points. The recipe calls for sifting the dry ingredients – to get rid of any lumps – but to be honest when I am truly pressed for time, sometimes I don’t bother. The macaroons still taste great, just with a slightly rougher texture. But I did sift the dry ingredients last night. Book club can be a tough crowd. Now if you were so inclined, you could think about piping the batter through a pastry bag into beautiful uniform circles and sandwiching them together with jam or chocolate or some other sticky filling. However, then they would be macarons, not macaroons. Personally I like the free-form look of these fudgy, squishy macaroons. And I don’t own a pastry bag. What I love about this recipe is that it is gluten and dairy free, but it doesn’t read like a science experiment. The recipe has just five ingredients that can be found at any supermarket. To me, that is what gluten and dairy free baking should be about. By the way, the book we read was A Visit from the Goon Squad, by Jennifer Egan, which I thoroughly enjoyed. And the macaroons were a hit too. Preheat the oven to 180°C (350°F/gas mark 4). Line two baking trays with baking parchment. Combine and sift (if you can be bothered) the icing sugar, the ground almonds and the cocoa. In a large, clean bowl, beat the egg whites while gradually adding the caster sugar, until they form stiff peaks (about 2 minutes). I use a hand-held electric mixer, but if you have a standing mixer so much the better. Gently fold the dry ingredients into the beaten egg whites. Using two spoons, drop evenly spaced mounds of the batter onto the lined baking trays, about 2 tablespoons of batter for each macaroon. Bake for about 15 minutes. When they are done the macaroons should have a hard outer shell but feel wobbly to the touch. 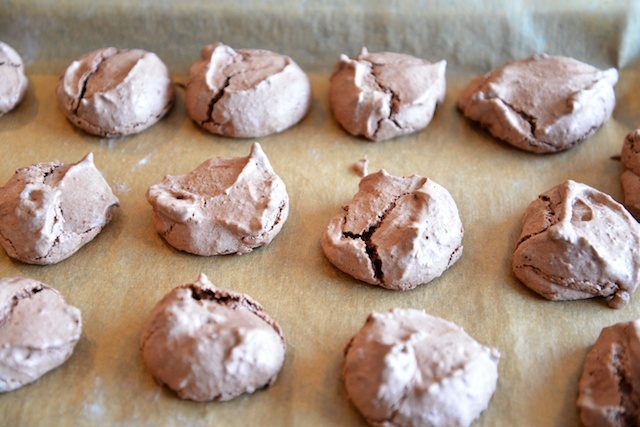 The macaroons will have a crunchy outside with a gooey middle. 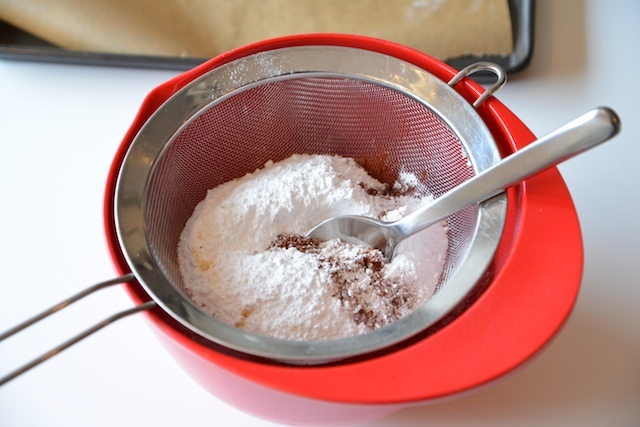 If you prefer a drier texture, bake for a further 5 minutes. Cool on a wire rack, then eat immediately with a good book or store in an airtight container for a day or two.